1545: the great vault of the Libreria fell; Sansovino was held responsible for the loss, imprisoned, and fined. 1997: ...far more manipulative of the model and 2D data in the collection. ...collaged-distorted designs demonstrating the true possibilities of "virtual" space and museums of architecture. ...new definitions of museums are also being created in the process--a "virtual" museum can go beyond the "mission" of a real museum. 1998: Is a lot of today's built environment an unwitting form of "plug-n-play" architecture? All this reminds me of Einstein's answer to the question "to what did he himself attributed the great workings of his mind?" Einstein basically answered that he never stopped thinking like a child, meaning he never discounted self-evidence and he never took anything for granted. 2000: The Latin word 'concepto' (a verb) means: (1) to conceive, become pregnant and (2) to conceive in mind. From my own experience as an architecture student and as an occasional jury member of student design presentations, the notion of formulating a 'concept' early on in the design process is an integral part of contemporary architectural education. I admit that up until five days ago, when I first read the Latin definitions above, I never connected the notion of formulating a design concept with the notion of becoming pregnant (although the connection in English is surely present in the word 'conception'). 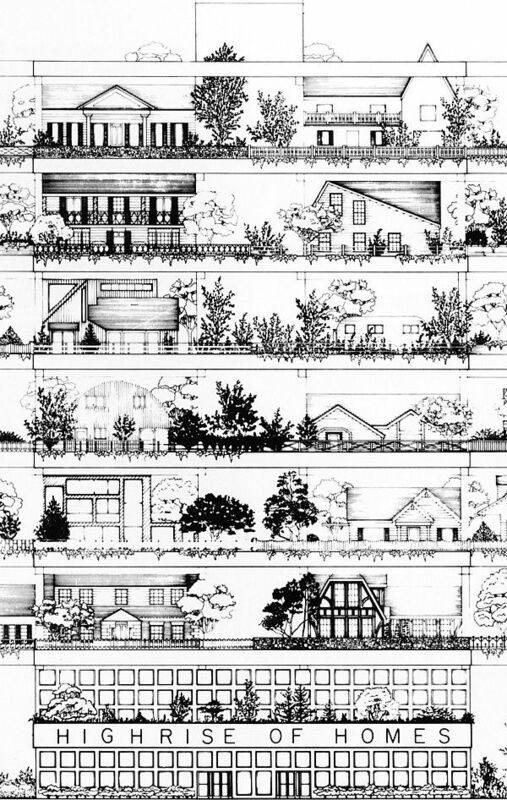 For me, concept in design meant an idea formulated from the building program and site, and this idea would both guide the design process as well as provide the design with a cohesion. It seems fairly clear that the notion of mentally attaining a concept is already a metaphor for physically becoming pregnant (and here I wonder whether the age old male striving for intellectual dominance is really nothing more than womb envy), hence a substantial part of design/creativity language is likewise purely metaphorical. Again, I'm not trying to suggest that a non-metaphorical language of architecture cannot be found or formulated, rather to point out that the concept of a non-metaphorical language is either: (1) already operating metaphorically in that mental conception reenacts physical conception, or (2) a non-metaphorical language of architecture is one that seeks to equal physical conception itself (i.e., to enact rather than reenact). because you will see a 'building' that is both literally and figuratively conception. This tiny building is indeed one of the few plans within the Ichnographia that Piranesi does not provide with a Latin label, and that is because the building, through its plan, already speaks for itself, and, moreover, it speaks of all the 'concepts' there involved, namely, Piranesi's conception of architectural language and the very conception of Rome [Romulus] itself. Piranesi's architectural intensification here is so tight to the point that indeed the medium is the message. And I now wonder whether it might be more worthwhile to seek a language of architecture where the medium is the message, or is such a 1=1 language the same as "a language of architecture that goes beyond appeals to a metaphorical sense of 'language'?" 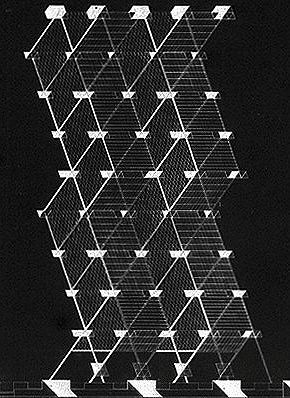 (which was a schematic proposal to replace Philadelphia's City Hall). A new physical model of the City Tower project was constructed just over ten years ago for the Kahn exhibition back then. I knew the model builders, and the design turned out to be much more subtly complex than first expected. I'd love to construct a computer model of the project, but without sufficient data, it's futile for me to attempt. Basically, it's one of those designs that is abundantly virtual in that there is no real building and even the schematics do not fully render what the real building would actually be like. Like you suggest via the SITE example, the City Tower project could wind up containing just about anything. Anne Tyng is also a key player here, and should not be forgotten. She's the one that was most interested in numbers and geometric constructs as structural systems. Her theoretical writing (from back then) is dense and often abstruse, but perhaps worth reading again with more understanding eyes. 2013: Reading 'conceptio' (a feminine noun) means (1a) a comprehending; hence concretely, a circuit, compass: the system of the universe [and here Vitruvius is cited as the source of the concrete meaning] again today made me wonder anew as to the significance of the compass of the Ichnographia matching exactly the plan of the Porticus Neronianae. 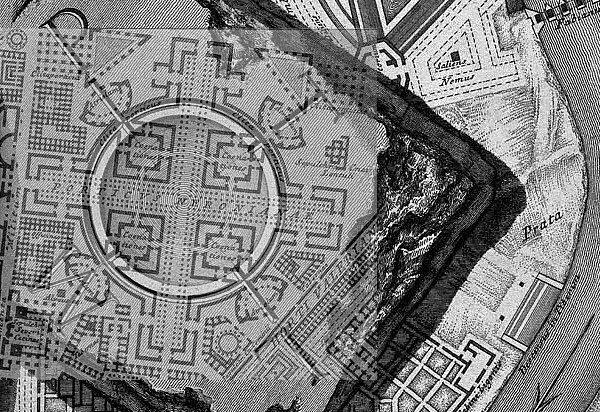 Was Piranesi covertly delineating the "system of the universe?"